Like many animals hamsters have developed their senses over thousands of years in the wild. They have evolved into the creatures we see today through the different challenges and trials they faced over this time. These challenges and trials have meant they have learnt to survive in their habitat even though they are prey animals and are hunted by many different predators. As prey animals, they have had to evolve their senses to cope with the challenges that have come their way. Their eyesight is one such sense that has evolved over time to where it is today. Hamsters are crepuscular animals which means they are most active around dawn and dusk and then through the night. In the wild they have had to develop their senses to be able to see at night so as to evade predators and to have to deal with the challenges that living at night-time have to offer. Their eyesight helps them with this as they can see in the dark better than humans can. They also use their sight to navigate and create different burrows that make up the living spaces. However this is brought limitations to their sight as well. An adult hamster can generally only see 1 or 2 inches past their nose. So why is a hamster’s eyesight so poor? The limited eyesight of a hamster unfortunately is a detriment of them being night-time creatures. As they rely on their senses to guide them at night the eyesight has become more limited as a result as it is not been needed as much. However they can see better in very dim light then when the light is bright. This is why they are crepuscular animals rather than truly nocturnal creatures. When the light is bright they are almost blind. So how do hamsters survive with poor eyesight? During the day time, they rely on their other senses to guide them such as the nose and whiskers. As crepuscular animals who are nocturnal in nature they spend much of the day sleeping and then are very active from dusk. Then during the night they use all their senses to guide then in the foraging for food. Taking your hamster’s poor eyesight into consideration is essential for understanding their nature and characteristics. This means that when they look up at you they can’t see you as such but they can hear you and can smell you. Their sense of smell is powerful and helps to guide them. You would never know to look at them for they had such poor eyesight because they are extremely good at navigating their way around. It is only when you get to know them that you see that the eyesight it is not so good. They can navigate all kinds of situations because of their senses and agility, so can get themselves out of tight situations and solve problems using the senses that they have. They are very intelligent creatures and follow their nose and whiskers most of the time. What eyesight they do have they use their advantage. Because of the position of the eyes they are able to see around them at short distances. They have a much wider range of eyesight than we do and are able to see greater angles than our eyes can. It is the range in front of them they have trouble seeing. Again this takes some getting used to understanding this will help you in your relationship with them. Learning to build a good relationship with your hamster is a good part of having one as a pet. You may not think you’re intimidating at all but to a much smaller animal such as a hamster, you are a giant to them and its something to consider when building a relationship with them. Indeed when you put your hand into their cage to try and pick them out, it’s only natural that they retreat away from your grasp to where they feel is a safer corner of their home. So getting the knack of luring your hamster out of their cage is something that is necessary but takes time to learn. But it is an interaction that is critical to their relationship with you and to help them to get to know who you are. So what are the best ways of luring out your hamster out of its cage? Don’t disturb them and try and lure them out during the day time when they are sleeping or are sleepy. During this time they are quite irritable and so it is better to leave this until the evening. After 6pm is usually a good time to do this and means they are more amenable to coming out. After being in their cage they are usually keen to come out and exercise. Get them out of the cage on a daily basis. In order to get them more familiar with what you want to do, the practice of luring them out needs to be done everyday. Once they get to trust what you are doing, then luring them out becomes that much easier. Be gentle with you handling and the way you speak to them. They had loud bangs and noises and so anything that will startle them will set the process back. There are different methods you can use to lure them out. If you cage that has plastic tubing one way to lure them out is to lower the plastic tube into the cage enough to encourage them to climb up it. Make sure the tube is closed at the other end. Once they have climbed into the tube they will more often than not, want to climb to the top and back so whilst they are in the process of doing this. Pull the tube out of the cage and place the end either into your hands or into a hamster ball so they can come out. I’ve found this a particularly effective way of luring the hamster out of the cage, particularly at the start of our relationship with him when hasn’t known us so well. Once they are in the hamster ball, you can pull the tube out and close up the ball ready for them to run. This often takes time to get to this place and they need to learn to trust you. To get to this, they will need to become familiar with you and know that you aren’t going to harm them. Start by stroking them everyday and spending time just at their cage. Eventually you will get to the point where they feel able to let you pick them up. When you do this remember to be as gentle as you can. What happens if they are hiding away and don’t want to come out? If they are hiding away in a corner of the cage or their hidey home then there are some methods you can use to lure them out into the open. If your hamster is hiding in their hidey house then a trick that many owners use are treat packages to lure them out. If you have one of these then crinkle it up in your hand your hamster will hear it and fingers crossed, they will come out at the sound of it. You will need to give them a treat as a reward so that they know to come out next time. If you don’t they won’t fall for the same trick next time. You can then use a tube to get them out or attempt to pick them up with you hand. You can also just give him treats inside the cage. Get your hamster to eat off your hand and help them to understand that when you put your hand in their cage it means that treats and food are coming and it is not a danger to them. They are prey animals and so think the worst is going to happen to them and so are always on their guard. Put your fingers in some kind of food packaging and get them smelling of food. A bag of chips is a good one. Then put your hand in their cage and rub your fingers together and speak gently to them. If they can get the smell of your fingers this may do the trick and they will be intrigued by what your fingers smell like and follow the scent. Giving them treats in their cage from your hand. By doing these actions, the whole process of luring them out of their cage will get easier and easier. If you have a hamster then a sleeping hammy is a common sight during the day time. It might seem frustrating to see them asleep mostly during the day and then as evening comes around they come around. For example, my Syrian is currently running around his cage at 11.26pm at night as I write this post. He has been asleep curled up in a ball for most of the day. However this was only for a short time before he retreated back to the nest he has made with gathered up tissue and wood shavings. So what are the sleeping habits of hamsters? Here are some features of what happens, what they do and how they do it when they sleep. As crepuscular rodents, they are more often than not asleep during the day. They tend to come awake once dusk comes around and then throughout the night. Their sleeping patterns are driven by their own biological requirements. Hamsters tend to sleep when they need to and wake up when they need to. Their crepuscular activity comes from how they are in their natural environment. The cover of dawn and dusk provides a good opportunity to look for food. During this time they break out of their cover and can avade any predators that are on the lookout for them. Do all hamsters sleep the same? Even though all hamsters are crepuscular, some varieties are awake more often that others during daylight hours. Syrian, Winter white dwarf’s and Russian Campbell dwarf hamsters tend to be active during brief periods during the day. Syrians though tend to sleep for longer stretches and do not like being disturbed during sleep. 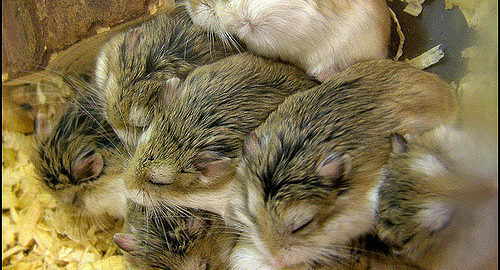 Roborovksi hamsters tend to be more active during the day than other hamster varieties. All varieties are more active during the night than during the daytime. As the night draws in, they continue to rely on their excellent night vision. They use it greatly to continue to hunt and collect food plus get the exercise that they need. Indeed, many experts say that hamsters can run on average around 9 kilometers a night. There are a few reasons why hamsters sleep mostly during the day. 1.In their natural environment, it gets hot during the day and cooler at night. It is much better for them to be running around at night and much more comfortable for them. So they have naturally evolved to sleep more during the day and be active during the cooler evenings. 2.The day light hours are just too dangerous for them in the wild. If they are out and about during this time, there is too much chance of being seen and caught by a predator. This is why they sleep more during daylight hours to this day. They have evolved their senses to be able to move around easily during this time. As humans we are monophasic sleepers which means we have one period of sleep over 24 hours. Hamsters are said to have a similar sleeping pattern. However, I have noted from my experience that are times they can have polyphasic sleep patterns. This is where they short periods of sleep which are divided up between short bursts of being awake. Hamsters tend to sleep lightly. This is again from their experiences in the wild where they need to stay alert to keep predators at bay. This is a familiar trait of many prey animals who can wake in an instant and run away if they sense danger. Some prey animals such as guinea pigs can even sleep with their eyes open. However, this is not a trait known in hamsters. As independent animals, they very much like to create their own place to sleep. I have never managed to get a hamster to sleep in its own bed for very long. They very much like to find their own place to rest and gather up bedding to sleep on. This very much shows their independent characteristics and every bed I have ever created for them they have pretty much ignored. Once they have established their bed, they tend not to move on and settle in the same place, even if I have to change their bedding. Even though they like to have a bed that is undisturbed, it is important that it is cleaned regularly so as to keep things healthy for they hamster. This is why any cleaning needs to be undertaken with consideration, no too often and not infrequently as to let feces build up. Spot cleaning of feces is a must. Hamsters do not enjoy being woken up. As mentioned above, this is particularly the case with Syrian’s. In fact this can stress them out if they are startled from their sleep. It is a bad idea to attempt to handle a hamster when it has just been woken as it may bite in reaction to being woken. Hamsters do not hibernate, instead they can go into a temporary hibernating state called ‘torpor’. Torpor is a state of decreased physiological activity which is reduced by its body temperature and metabolic rate. It is called ‘torpor’ as it is a much shorter time than hibernation lasting from anything between a few hours to a whole day. It is caused when temperatures drop below 40 degrees farenheit and they do so for self preservation and in that time their breathing is slowed and they can go for long periods without eating food. Hamsters tend to live between 2 – 3 years on average when they are in captivity. Some Syrian hamsters have been known to live up to 5 years. So is there anything we can do to elongate their life span? Here are 9 things you can do to help your hamster live longer. The teeth of hamsters constantly grow. This is from the time they first grow them to the day that they die. The way they trim them down is to chew things, and by things we mean anything. If suitable items to chew are not provided for them, they will attempt to chew the next best thing. This can often lead to them chewing unsuitable items, like the bars of a cage or plastic in their cage. When they chew on things like these, this can cause damage to their teeth and give them problems, particularly in later life. So give them chew sticks to nibble on and chewing items to attach to the cage, this will keep their teeth ground down and stop any needless trips to the vet to get their teeth trimmed. A good intake of food is essential for the life of any pet. Indeed, a healthy diet can greatly aid the life of a hamster. A daily diet of hamster pellets topped up with suitable vegetables can really help them and mixed with sunflower seeds, oats, corn, barley, and wheat. Don’t overfeed them vegetables as too much will have a detrimental effect. Too much calcium, fat, phosphorus, sugar, salt or water can harm them so be careful with the foods you give them. The food guides on this site should help you with this. Just type in the food you are looking for in the search bar and we will have a review for you. Hamsters are not social animals and don’t react well to others sharing their cage. The only way they will share their cage is if it is with a close family kin. Otherwise, any other hamsters should steer clear of each other. Hamsters that grow up together are usually fine to stay with each other. But the process of introducing strange hamsters to each other is problematic and can result in fights and unfortunately fatalities. When stranger hamsters are forced together it will not end well on the majority of occasions. So it is better just to have a single hamster on its own to keep them safe from each other and from other animals. Not many people like living in a badly kept home, and this is the same with a lot of animals including hamsters. When a hamster cage isn’t cleaned out regularly, then feces can build up and attract bacteria to the cage. It is also creates an unpleasant smell after a while with the build up of feces. Keeping the cage clean for them is vital for the health of your hamster. This starts with spot cleaning every day to cleaning out bedding every week on a regular basis. Every three months, it is recommended that the whole cage is cleaned thoroughly and disinfected so as to clean it of bacteria that maybe building up. This can be done, either by soaking the cage in hot water and using bleach or using animal friendly disinfectant. If using bleach, you will need to soak it in hot water for 24 hours afterwards to wash off all the bleach. It needs to be completely dry before putting it back and restoring the hamster to its cage. By having a consistent cleaning routine you can ensure that your hamster lives happily and contented in its cage without the hindrance of rotting feces around it. Hamsters need constant access to water. Just like us, they need it to quench their thirst and to keep them healthy. Having a water bottle filled with a good supply of water is vital for them. Bottled water or water fro a tap is fine for them to drink in this regard. Avoid sparking, flavored water and make sure it is just cold water and nothing else. Water bowls are not so good giving them water so rely on a good sized water bottle instead. Wet tail is an ailment found in Syrian and Chinese hamsters. It is an ailment that can kill them easily if it is not identified and dealt with. Wet tail is caused by stress, poor hygiene and overfeeding of veggies plus water that is of poor quality. Such stress is caused by such things as too much handling, a change in diet, being away from a mother or siblings, illness or death of a pair-bond or mate or a change in environment. Wet tail is basically a disease which is found in the animal’s intestines and caused by the bacteria, Lawsonia intracellularis. The main symptom for wet tail is if the hamster has a tail that is wet and has been matted with faeces. However, other symptoms can be diarrhea, Lethargy, Lack of appetite, excess sleeping, folded ears, and smell/foul odor. If it is not spotted within the first 24-48 hours and dealt with by a veterinary doctor then this can kill them. A hamster can get diarrhea due to a virus such as salmonella or influenza, by eating too much greens or foods that have laxative agents, living in poor conditions or being increasingly stressed. Their feces will become lighter and softer in color and maybe watery in some instances. They will look sick and lethargic. They may also lose weight. If you discover any of these symptoms, a quick trip to the vet will head of diarrhea and can be treated quickly and effectively. Exercise is vital for hamsters. It is a part of their nature to spend a great deal of their time exercising. They also love to run and do not settle still for very long. This is why they need plenty of exercise. A large enough cage for them to run around in. An exercise ball for them to run in. A large hamster wheel for them to run in that means that they don’t arch their back too much. By spending time with your hamster on a daily basis you can head off problems they may have, you can spot changes in behavior patterns, what they are eating and not eating. They can get to know you and trust you. Learn to hold them and play with them so that they feel comfortable in your hands. If they are left alone you cant keep up to date with how they are, what they’re doing and if there is anything that needs addressing. The more time you spend with them, the better your relationship will be, the more you will understand them, their needs and requirements. Help, My Hamster Chewed Through Its Cage! Ever had the situation where you find that your hamster chewed through its cage? I guess if you’ve found this article, this might well have happened to you. My guess is that it happens more often than not and many owners experience the problem of eager hamsters. Why does a hamster bite through its cage? Hamsters have very sharp teeth desperate to gnaw their teeth on something to grind them down. Hamsters always need something to chew on and the sides of a plastic cage for example provide ample opportunity for them to chew on something if they have nothing else more desirable to chew on. When biting through a cage, then plastic is the most likely to be gnawed through by a hamster. It is much more likely than metal and easier for them to gnaw through than metal bars which will take them much longer. This may have also hurt their teeth as plastic is a very hard substance for them to chew through. So what should be done if you find that your hamster chewed through its cage? If you’ve noticed a small hold in your cage then its only a matter of time until it grows into a larger one. There are some different alternatives to choose from if you have previously had a plastic cage such as a glass aquarium which would solve the issue once and for all. However, glass aquariums are more expensive in price than plastic cages and so there is that to think of. If you’ve discovered a hole in your cage then it may mean that not enough attention has been given to it. The hamster would have spent some time biting through the cage to breakthrough like this. Try and inspect the cage daily and spend time watching the hamster inside its cage watching where it is trying to chew. Keep the cage fresh and a make it a nice place for your hamster to live. A cage that smells and has not been cleaned out in a while, is not a nice place for them to live. Give them reasons to stay rather than break out. make sure they have plenty of nice things to chew on that will help them. Plastic isn’t a nice substance for them to chew on and they would much rather chew on something nicer. Spraying a bite deterrent such as lemon juice on a regular basis onto the cage surfaces would also serve as a short term fix for this problem. Vinegar also works well for this as well. By paying more attention to your hamster, giving them nice objects to chew on, cleaning their cage out weekly, and having bite deterant as a back up would really help.